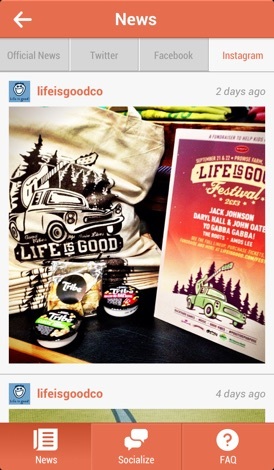 The official Life is good app is your one-stop-shop for all things Life is good 2012! Use this app to find out when your favorite acts are performing, create your own personal schedule for the weekend, and find fun activities and games for the entire family! 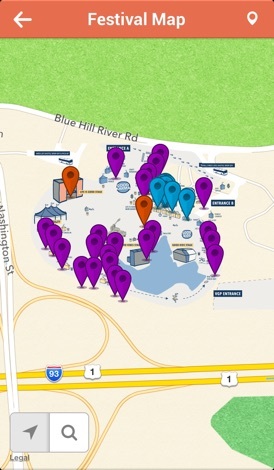 The Life is good map uses pins to indicate where each stage, activity, and game stations are located. You can even create your own custom pin location! Browse the performers at this year’s festival, and add them to your own schedule! Don’t want to miss out on a particular performance? Set an alert to tell you when and where they will play! In the time and stages tab, you can access a grid view that shows all the acts of a particular day! 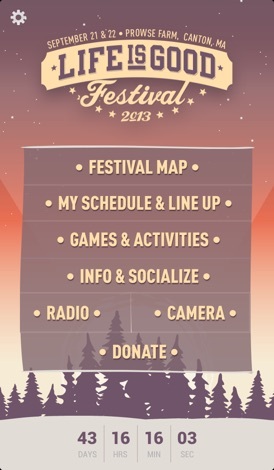 This visual guide to the festival couldn’t be simpler to seeing the schedule of the whole weekend! Want to see what your fellow festival-goers are enjoying? See the most liked and most scheduled acts of the festival. Maybe you’ll discover a new act you’ll want to check out! Capture your favorite moments and memories with the Life is good camera. Take a snapshot, apply a filter, and share it with your friends and family! A robust and comprehensive feed of all things Life is good. See the official Life is good tweets and Facebook posts, @ replies to the festival’s Twitter account, and even your own social feed from Facebook and Twitter. Post a status in the app without having to switch to your main Twitter or Facebook app! This app calculates the value of resistor, when designing a circuit using LED. Download this useful app to get the latest schedules, presenting company information, speakers, maps, logistics information and more for the upcoming Deutsche Bank conferences. Are you looking for the closest pharmacy on duty? This free app will help you find it everywhere in Belgium. It uses your GPS location to give you all the info on the nearest on duty pharmacies. This app also gives you directions tu quickly find the pharmacy. A Search Engine to provide those with a need for services, focusing on those who are Differently Abled.